Jonathan Neil Rhodes, popularly known as Jonty Rhodes is a former South African cricketer, who was born on 27 July 1969 in Pietermaritzburg, Natal Province, South Africa. This right-handed batsman is considered one of the best fielders of all time and no one other has fielded better than him in backward point position. 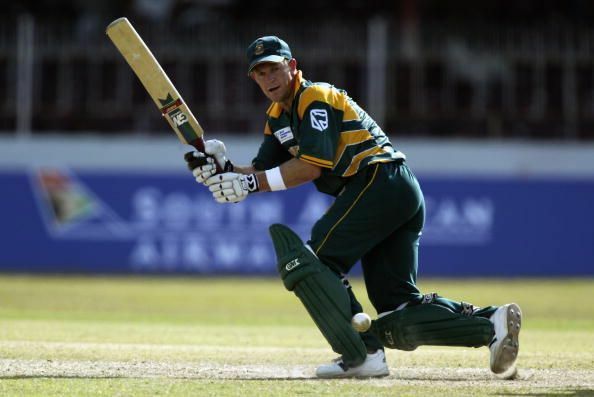 He served South African Cricket between 1992 and 2003. In 1999, he was voted as one of the Wisden Cricketer of the Year. In his childhood days, he used to play cricket with his brother Clinton and was coached by his father. After playing a lot of school cricket, he went Maritzburg College (University of Natal) and in 1988, he started playing cricket for University team. Soon, he made his first class debut for Natal. He was blessed with Hockey skills which helped him run faster in the field and made him different from other fellow cricketers as fielding was not considered that important in cricket those days. Rhodes made his international debut on 26 February in the 1992 ICC World Cup match against Australia at Sydney Cricket Ground. In his debut match, he didn't get a chance to bat as it was a low scoring match which South Africa won easily. However, he contributed in fielding and dismissed Craig McDermott via a run out. People's eyes caught him when he run out Inzamam-ul-Haq in fifth game of the tournament. That run out was special because rather than throwing the ball towards stump, he himself sprinted to the wickets and made a full length dive to get the batsman which was not common in that time. Initially, Rhodes was not comparatively good with the bat and was picked up in the team just because of his electrifying fielding. Later, he understood that he had to perform from the bat too. In 1997, he completely changed his batting techniques and improved as a batsman. After the change, he averaged 50 for the rest of his Test career. In 1997, his innings of 83 runs in 76 balls against Australia was match winning. A year later, he scored 95 off 94 balls and helped his team to win the ODI series against Pakistan. His one of the best knocks in Test cricket came against West Indies on 15 January 1999 when he scored 103*. After his sudden retirement, he played for Gloucestershire in 2003 and finished the season with 1,293 runs at an average of 58.77 with 5 centuries and 7 fifties and was the only batsman of his team who scored 1000+ runs in the season. On 14 November 1993 against West Indies, Rhodes took five catches, the most dismissal by a fielder apart from the wicketkeeper. He has three centuries and 17 half centuries in his name in Test Cricket. In ODIs, he scored 2 centuries and 33 half centuries in 245 matches. Rhodes had planned to take retirement from the international cricket after 2003 ICC Cricket World Cup but forced to take it earlier because of an injury. Although, he played for Gloucestershire in the same year. Later, Standard Bank hired Rhodes as an account executive. He is currently serving South Africa as a fielding coach. He has also served Mumbai Indians as a fielding coach in IPL. In April 2013 South African Tourism appointed Rhodes as their brand ambassador for India.